The Eleanor Roosevelt girls have won the previous eight 4A indoor track state titles. In fact, they have won 17 of the last 19 4A indoor track state titles. They are going to win again. They won't win every event like they nearly have some years, but everybody knows they will walk away with their ninth consecutive trophy this year, too. Churchill High School from Montgomery County should be able to come away with a top five finish. I won't recap everything Eleanor Roosevelt has already accomplished this year, but one of the many athletes to watch out for on their team is their new star sprinter Aurieyall Scott. Scott is currently ranked #2 in the nation in the 300-meter dash (38.95) and #11 in the nation in the 55-meter dash (7.03). She earned both of those rankings from the very fast banked track at Virginia Tech. 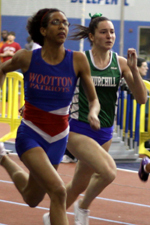 Right behind Scott in the 300-meter national rankings at #3 is Wootton's Olivia Ekpone who still owns the nation's fastest 300-meter time run on a flat track (38.96). Ekpone's personal best from last year of 7.05 in the 55-meter dash will put her right with Scott in that race as well. 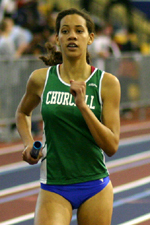 Throw into that mix Abidemi Adenikinju of Eleanor Roosevelt who ran 7.10 at the 4A east regional meet, and Katie Wolf of Churchill who ran 7.14 earlier this year and the girls' sprints are going to be outstanding! The girls distance events look relatively weaker than they have in the past, and Churchill will be the team to best capitalize off of that. Churchill enters the meet with the top seed in the 4x800 relay, which they should be able to back up pending who Eleanor Roosevelt puts on the track to run it. Maryam Fikri and Alex Giedd will score as much as they can in the 800 through the 3200 to help their team. Churchill may also be able to grab some points in the hurdles and the 4x400 relay. One of the biggest surprises of the 4A West regional meet was Gaithersburg's Lauren Rose taking down the vaulters from Frederick County to win the regional title. Not only did she win the region, but her mark of 9-01 ties her as the top seed heading into the state meet. A repeat of that performance could make her a state champion. If you're looking for a state record to be broken, look no further than the girls' shot put. Emily Vannoy of Thomas Johnson will be going after her own state record from last year of 45-09.25, a mark she has topped on multiple occasions this season. There was a lot of buzz last week when the performance lists were released and Thomas Johnson and Eleanor Roosevelt were projected to be the top two 4A boys teams. I maintain that Gaithersburg was considered the favorite to win before those projections were released, and Gaithersburg should still be considered the favorite to win. Sean Stanley should win the shot put having a season best throw of 60-00.50, and Owen Cain should win the high jump having a season best jump of 6-07. Cain should also finish top three in the hurdles if not win them. There is still more scoring potential from Alimamy Kallay who was one of seven guys to jump six feet in the high jump at the regional meet. 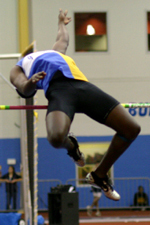 Kallay is also seeded sixth in the 55-meter hurdles and seventh in the 55-meter dash. Then there is Antonio Palmer. Some fans may have lost confidence because he can no longer run away from Wayne Bartholomew at will. Let's not forget that even if he can't beat Bartholomew, that still might make him second best in the state. If you believe the accuracy of the times from the 4A east regional meet (almost all races were hand-timed), that lands Palmer as the third seed in the 500 and the sixth seed in the 800. When was the last time Palmer finished sixth in an 800 race? He is tougher than that, plus he won't have the 300-meter dash to wear him out. 44 points is a reasonable projection for Gaithersburg and should be enough to win the state title. The 4A west regional titles in the six open running events were split up evenly among three boys. Solomon Haile of Sherwood won the 1600 and 3200. Wayne Bartholomew of Quince Orchard won the 500 and 800. 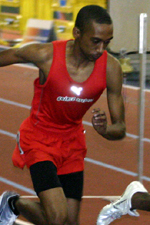 Hassan Dixon of Northwest won the 55 and 300. It is possible that all three of those guys win two state titles this week. Haile has the easiest road as the national champ remains unbeaten and a cut above the rest this year. His times so far this season put him ahead of the 3200 state record (9:30.06 state record) and just behind the 1600 state record (4:16.98 state record). Bartholomew by no means has an easy road to victory this year with a half dozen runners in the race seeded under 2:00 in the 800 and several more who are close in the 500. Despite the high level of competition, he looked terrific at the regional meet and should be considered the favorite to win both races. Dixon has a tough path to victory. Being new to public school indoor track, he is relatively unfamiliar with both events, but he is no stranger to sprinting. His times speak for themselves and he is excited to see what he can do at his first state championship. Dixon and the Northwest 4x4 will also challenge for the relay state title. Jonathan Haughton of Blair, who was the outdoor 200-meter state champion, won the "fast heat" of the 300 at the 4A West region meet only to discover that Dixon beat him out of a slower heat. Don't count out Haughton for the win. Last but certainly not least I must mention the boys 4x800. 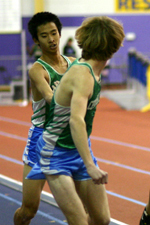 For most of the season I thought that Churchill and Damascus were the top dogs in Maryland when it came to the 4x800. I thought they would both go on to easily win their respective state titles, but look what Broadneck unleased at the 4A central region meet. Broadneck's time of 8:09.94 gives them the top seed and sets up what should be a thrilling race. The state record of 7:59.23 is not out of the question. Good preview. It should be a good meet. It looked like Palmer had some issues with his hamstring after the 800 last week so that could be a factor. Not having the 300 before those could help him out there. A big factor with Cain/Kallay in the hurdles and high jump is timing. If they have to run hurdles and come back and attempt to clear heights it could cause some problems for them.